In Mali and Burkina Faso, one in seven children dies before age 5. The majority of these deaths are caused by simple illnesses that could be cured in the local primary health care centers if treated in time. In the poor urban and suburban zones where Pesinet works, these health centers are geographically accessible, but remain underused. What are the real barriers to care in these areas? Why are so many children still dying from illnesses we have the means to treat? Many of the children who die from these simple illnesses were weakened by chronic malnutrition, making them unable to survive diseases that a child in good health could resist. For example, a deficiency in vitamin A is enough to increase the risk of dying from diarrhea, measles and malaria by 20-24 percent. Another related issue is the education level of mothers. In Mali, for example, illiteracy among adult women is as high as 80 percent. The Western model of modern medicine is still foreign to many of these women, even if it has been widely adapted by their governments, and they feel intimidated and out of place at the health centers. Finally, even at the primary care level, many families worry about the cost of care. The average annual income in both countries where Pesinet works is less than $2 a day, and is highly variable from month to month. The result is that government health centers, which rely on payouts by patients to finance a large part of their activity, are underused and underfunded. Meanwhile, the high child mortality rate persists. Our first pillar of intervention is disease detection using mobile technology. In partnership with the local health centers, we hire a network of mobile health agents and equip them with a scale and a smartphone. 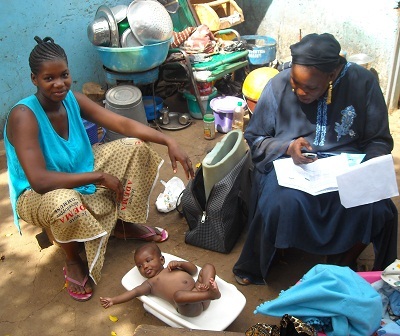 These agents make the rounds of subscribed families in their zone and weigh each enrolled child several times per month. The data they collect is entered into an application on the phone and sent to the partnering health center where it is received and processed in real time by Djantoli’s computer software. With this software, each enrolled child has an electronic medical record with his or her medical history, weight curve and other key indicators collected by Djantoli’s agents (breastfeeding, cough, number of stools, etc.). When the doctor at the partnering center logs in at the start of every day, the system presents him with a list of children “at risk,” which the software has presorted according to programmed parameters. The doctor reviews this list and if needed checks a box that sends an SMS alert to the agent who then returns to the family and advises them to consult. This pillar is thus aimed at detecting malnutrition or chronic health problems among subscribed children, as well as the most common acute illnesses, and encouraging the family to access care. The second pillar of intervention is education for mothers. During their regular home visits, the Djantoli agents coach mothers on key signs and symptoms to look out for – a cough or a fever, for example. They also organize regular “health talks” with women in the community on pertinent health topics. Mothers can also ask the agents for help understanding prescriptions or following a course of medications. This pillar is aimed at getting mothers to spontaneously access care between the agent’s visits, and spur the implementation of certain preventative measures at home. Our third and final pillar is a basic microinsurance program. Families who enroll in our service are eligible for deep discounts on consultations and/or subscribed medications at the primary care level. We don’t want cost to be a barrier to the timely access of care for our families. This comprehensive service costs less than $2 a month per child. Our objective is to implement a service that is financially sustainable at the operational level. This, however, is very challenging given the poverty of the communities we serve. In order to make our service accessible to the majority of these families, we currently subsidize it with outside funding. We are constantly looking to improve our business model, making our service more financially accessible to BoP beneficiaries and less reliant on grants. Djantoli is a young organization. We launched our first operations in Bamako, Mali, in 2009 and last year we launched our first operations in Ouagadougou, Burkina Faso. A major innovation to our model in Burkina Faso is that we work in partnership with local microfinance institutions to bundle our service with their products, in order to make our service more financially accessible. Microsavings and loan products help families earmark money for the service or generate extra revenue that helps them pay the monthly fee. It also increases uptake, as the partnering microfinance institutions provide us with a network of clients for fast diffusion of the Djantoli service. In Mali, experimentation with a premium version of our service was put on hold during the political crisis, but as political tension dies down in the capital we plan to reopen the experiment. Sales of the premium offer would help us cross-subsidize the basic service we offer to poorer families. The Djantoli service is complex to manage and operate but provides a simple, comprehensive service to our beneficiaries. It is well adapted to the daily routines of the mothers it serves and takes into account both their logistical and economic constraints. More than 2,000 children have been enrolled in the program since its launch, and we have a 94 percent client satisfaction rate, according to our last survey. We are hoping to greatly extend our reach in Ouagadougou and Bamako in 2014. Elena Bridgers is a project manager at Pesinet. She lives in Paris.